The labels have clear, attractive printing that does not smudge. Labels pull off the roll easily and stick well to the envelope/package. 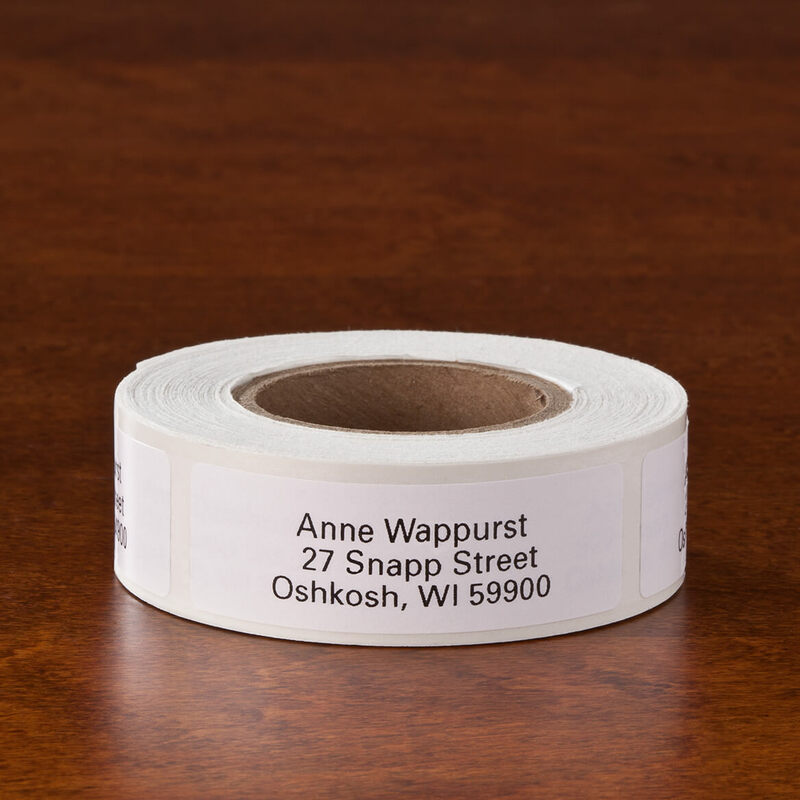 Reasonable price for return address labels. Perfect for letters and cards. Less expensive but not cheap by any means. We use these instead of labels purchased from check printing companies. Very happy. Ordering was easy, the mail was quick, and the product was super - just what I expected. Have a long name and a long street address and have arthritis of hand so writing a return address becomes painful. The labels are a lifesaver. I have always found these labels to be good quality and continue finding other uses for them other than as a return address sticker. Wow, so happy i was recommended mileskimball. unbelievable pricing and value. Add to that rock solid quality. I've added this to my "business" favorites as my new labeling vendor. 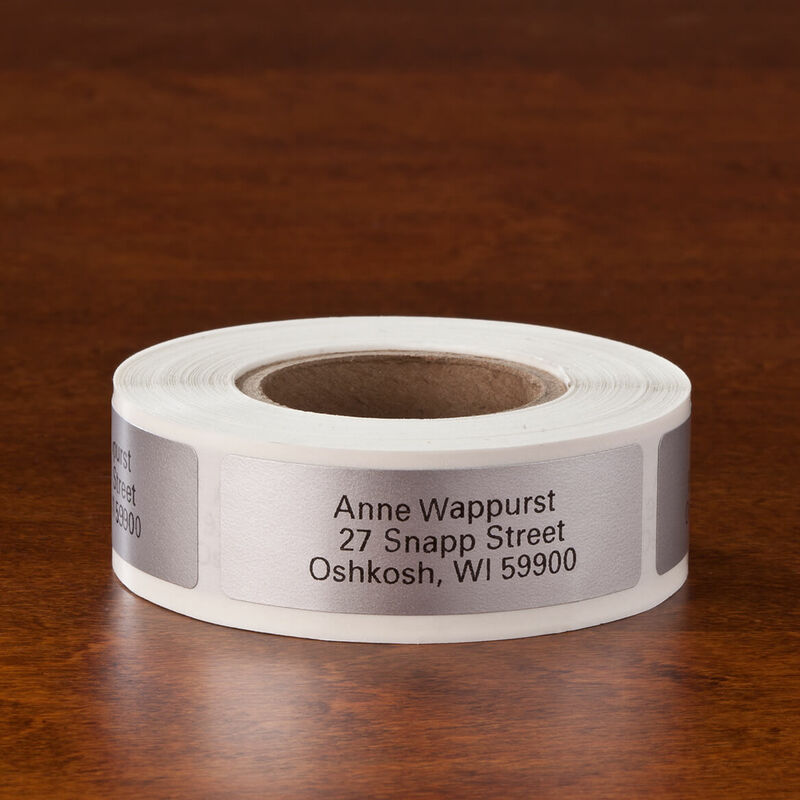 Labels are perfect for any size and type of envelopes. I used them for regular mail correspondency, invitations, Thank you notes and Christmas cards. 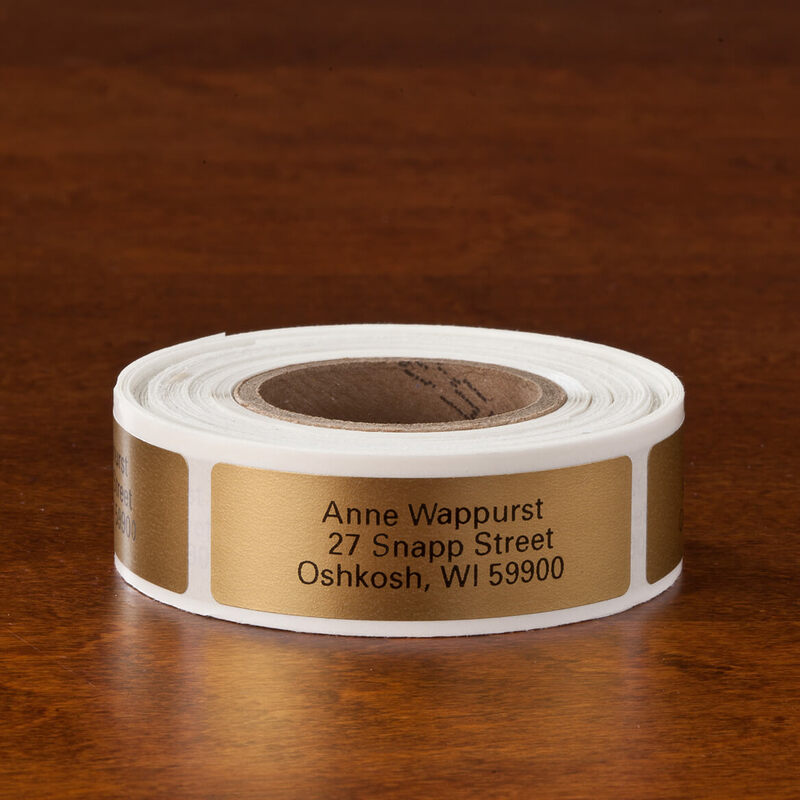 These are great for use as my product labels as well as address labels. The product came in an easy to store and use roll. Doing a class reunion. These are perfect and the color of gold was the school color. What better! I was looking for quality labels and found them at MilesKimball. "Free" labels have two major drawbacks: You can't choose how they print your name and, since so many people use them, your label doesn't stand out. With these labels, my name is how I want it and my envelopes look quietly elegant. I have bought them before. We use them on our maple syrup bottles. They don't come off! My address labels arrived fast! I was very happy with the speedy service. The standard print on the return address label is very nice. Previously had purchased from other online source and the print was too large and bold. Very nice , easy to stick on . 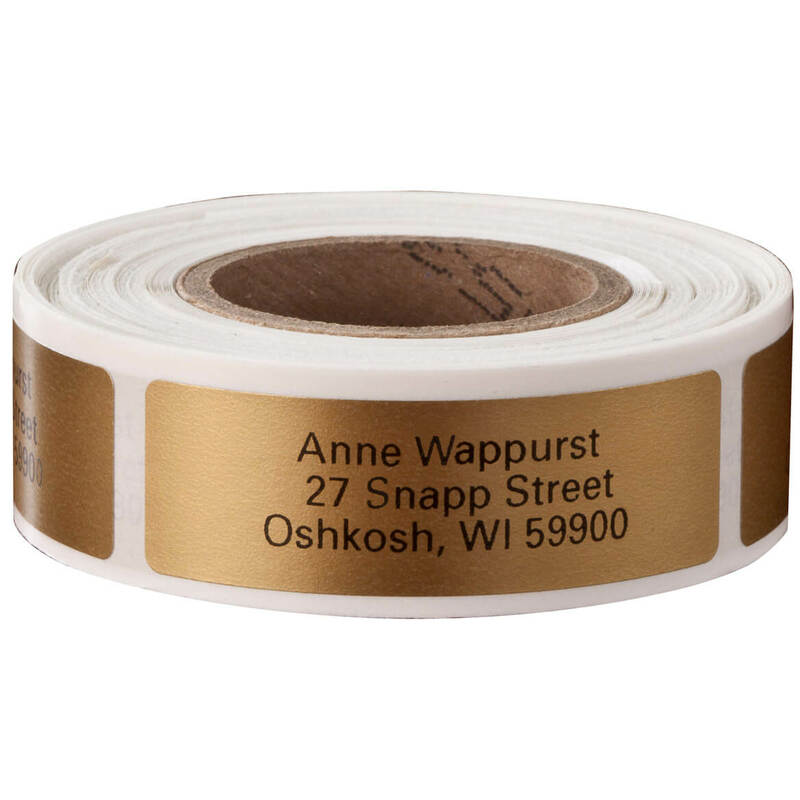 I am pleased with my purchase of the 250 self-stick address labels (gold). The paper and printing are good quality and it's convenient to have them for mailing bills, etc. In addition to using these as return address labels, I often stick them to paper with my phone number or email address to quickly exchange information with people I meet. Very helpful when you move and have to put your new address on everything. On everyday correspondence, plus bill paying, and time I need to reply to incoming mail. Color code who is business, family and friends. Long lasting. Easy to use. Very happy Customer! Easy ordering, and fast, cheap shipping. Easy order process and timely delivery. Would definently use agin. [...] Although my label was printed in 5 lines, I would have prefered a little bolder print. but at any rate I am quite satisfied and will order again in the near future for more labels. It was just what I wanted, needed and the price was right too. Has made my life a lot easier with these labels. Miles Kimball has always been the standard bearer for address labels. I admire their accuracy and quality. Once you've tried Miles, there are no other styles!!! The labels are used for my business. when product is purchased and placed in a bag, I seal the bag with the label and also have another on the bag so customers have another avenue to reach me for more business. The labels work great and all my customers will know from a glance where to contact me. it is just what i wanted--attractive, clear type, easy to place. prestigious looking. I love the dispensers. I have used this product for many years & return time & again to keep labels in stock. They are professional enough to use for job-hunting & elegant for cards & mailing invitations. They are an excellent value. I used these Glossy Silver return labels on my Wedding invitations, which I loved! These labels were the finishing touch and made my wedding invitations! Great product. My only request is that it took a few weeks to get to me, which I was expecting more of a quick turn around. Have bought for many years! Have used MK self stick return address labels for many years. They are great! Hard to find smaller print labels...excellent price...If you want it done right...order from Miles Kimball.. These labels are great quality! The white labels are just the right size and style for a professional look. Keep making them and I'll keep coming back. Love this company! Because I ran out of them. I always get the address labels and bamboo tongs and I was running out of them. I needed an egg drawer and butter dish and I liked these. I have ordered labels from MK for years and have been very satisfied with them. The quality and price has always been great. To make sending bills out easier for my father. Hoping to get in all three colors gold, silver, white, but they all show a gold picture in the review! I knew what I wanted to order, but after checking with several vendors, your shop had the clearest, most user friendly, computer access. Everything about it was easier to navigate. I appreciate your attention to the details when ordering and will definitely use your company again. Thanks for your attention to service. there easy to use and less trouble keeping up with. My husband and I have been using these stick-on address labels for years - for so long that I can't remember the first time we ordered them. They are, in every way, great; quick and easy to use, handy, inexpensive, durable, legible.... This order was a replenishment - I guess you could say these are so great we can't do without them! I want a roll for each of us, my wife and myself. This is a convenient way to assure my loaned books will find their way home. Simple design. The roll is convenient. Great price...especially to Hawaii. Thank you so much! We've had these before and they were very nice. We like labels and hope they are easy to get apart. attractive....easy to peel....love the roll ! I've used these same labels for many years and really like them. It's easy to just peel off the address label and apply it to an envelope. I've used these for years and love them. Very good web site and ease of ordering. I love these labels because I can fit 5 lines of text on them! They look great and are great quality! I have ordered the gold return labels before and always like the quality. I have always loved the self stick address labels, they look good and they are very easy to use keeps me from having to write my return address on all my mail and I am old school so I still send a lot of mail . We've used you before for these labels and were satisfied. I just moved to this address and needed return labels. Good price and easy to use website. Saves time over hand written! Purchased this item in the past and very satisfied with this company. This is a label reorder have used these labels at least three different reorders without having any problems with the labels. Also hadn't had any problems ordering or delivery of the labels from Miles Kimball. I would like the address labels, but I would like them for Mr. and Mrs. Vernon Derhak is that alright? BEST ANSWER: Thank you for your question. You can personalize the labels with the personalization that you would like as long as it fits in the limited characters. We hope this information will be of help to you. I have had the labels with Mr and Mrs on them. They look very nice. If my husband hadn't passed away, I would still be getting the labels like that. should work. We just used our first names, not Mr. And Mrs.
Sure, that would be just fine! Is a holder for the roll included? BEST ANSWER: I purchased my address labels roll several years ago and it's currently in a plastic holder. I honestly don't recall if it came with this particular roll or if it was from a previous one, however. You could call customer service to verify. Thank you for your question. Yes, these come in a box. We hope this information will be of help to you. Where do I enter my information? BEST ANSWER: Thank you for your question. After you choose what color label you would like you need to click the green personalize button. Once you click the personalize button you will be taken to the button on the website where you will be able to enter the personalization you want into the personalization fields. We hope this information will be of help to you. 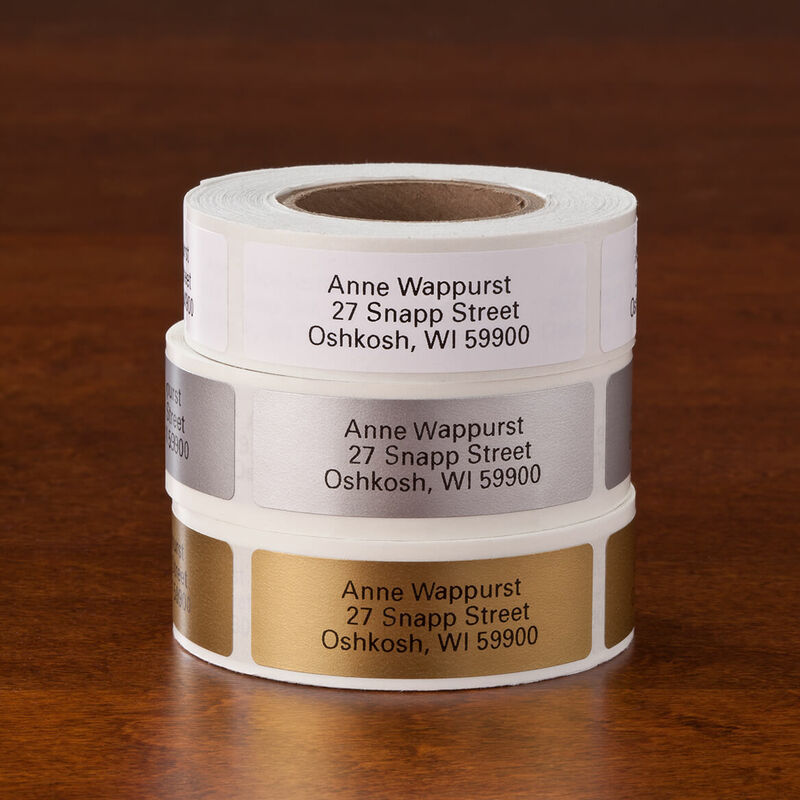 Complete the order form exactly the way you want your labels printed! Can I really use all 5 lines? Yes. I have ordered labels for many years. do you have any labels that can accomodate 5 lines with more than 25 characters per line? BEST ANSWER: Thank you for your question. We do have a few labels that can have 5 lines. The label will tell you in the item description if it has 5 lines or less. We hope this information will be of help to you. Can I order them in a different font? BEST ANSWER: Thank you for your question. These labels can not have the font changed. We hope this information will be of help to you. how long does it take to receive order? BEST ANSWER: Thank you for your question. Orders placed with standard shipping require approximately 6-10 business days for delivery. We do have express shipping options available for an additional charge. We hope this information will be of help to you. I want to order 2 rolls, same address on each, but different names. Will this be confusing? BEST ANSWER: Thank you for your question. No, just order each set on separate lines on your order. We hope this information will be of help to you. What accounts for the $3 price difference between #310880 and #31087?9? BEST ANSWER: Thank you for your question. The difference is the amount of labels on the roll.We hope this information will be of help to you. My address requires 4 lines, can I do that?Are 4 lines available? instead of address can i just have a contact number? BEST ANSWER: Thank you for your question. Yes you can put whatever you want that fits within the character limit. We hope this information will be of help to you.